Get frosty with this super easy and delicious smoothie! Ft. almond-milk yogurt and made with lots of love! 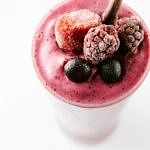 Place ingredients into your blender, blend until smooth, stopping every now and than to scrape down the sides if needed. Add an extra splash of non-dairy milk or water as needed. Serve as is in a glass with straw/spoon. Alternately, serve in a bowl making a smoothie bowl. Serves 1 large or 2 small smoothies. If concerned with too much added sugar, I would suggest using Silk’s Almondmilk Plain Yogurt Alternative. It only contains 6 grams of sugar per 5.3 oz. serving. The nutritional information shown below is a general idea. It is not completely accurate, but is pretty close. These yogurt alternatives are so new that they are not yet in the nutritional database that I use.